If ever there was a tacky representation of the 70’s and 80s then the Chrome executive toy must be a top candidate. Apart from the Chrome NEWTONS CRADLE Executive Gadget the rest were pretty well awful. 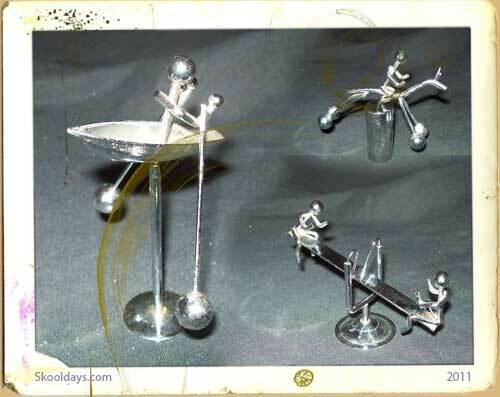 With chrome rowing and skiing men or tightrope walkers, horse riders and kids on see saws, the chrome desktop executive toy was then put in production. Suddenly every house and office had several on display as every factory churned out barrel loads. Executive toy sounds a little over the top. Lets look at the facts. It seems the idea started off in Japan, some guy bored in his lunch hour decided to make the toy, and before he knew it he had a world wide hit on his hands. The original chrome toys were quite expensive, but imitations soon followed. Did you remember this toy or any others chrome variations?